Since posting an article about my interview with Alex Krebs at Tangofest in 2008, I have received several requests to publish the fully transcribed interview. It is finally here in two parts (due to length). Revisiting this interview was a great experience; Alex is an excellent dancer, musician, instructor, and thinker with a great perspective on the dance. Part 1 covered how Alex discovered tango as well as his reflections on connection and flow. This second part covers his approach to musicality and his unique experiences with forming a tango orchestra and learning the bandoneón. In case you’re not already familiar with Alex Krebs – or even if you are – here is a video of him dancing with Evan Griffiths in 2006 (Alex is the tall one!). [Note: You can watch Alex and Evan perform to a remix of the same song in 2014 here.] Watch the video, then dive into the interview. Enjoy! You touched on musicality earlier in terms of what makes an enjoyable dancer, so let’s talk about how you define musicality and why you think it’s so important in the dance. I’ll start with the latter. I think dance, at least social dance, is moving to the music. Even dance in general. If you go disco dancing, a good disco dancer is someone who’s moving to the music. You can have great steps, but if it doesn’t fit the music… That’s why I say in social dance, because I’ve seen modern dance performances and there’s a very, for me, unusual sense of musicality, if there is any musicality there. But in social dance, if you dance salsa or swing or tango or ballroom or whatever, if you’re not with the music you’re just not dancing. And you can be proficient on a basic level – the slow-quick-quick-slow – but there’s a lot of stuff that’s beyond that. And then the first question was how do I define musicality or what makes someone musical… It starts with the ear, the ability to hear what’s in the music. Again, right when you come into the dance, at least with Argentine tango, it’s hard to even hear the slow beat. There’s lots of accenting in strange places, a lot of syncopations. A lot of people have a hard time just hearing the beat. So hearing the beat is the first thing. Hearing how to do a quick-quick-slow with the time, if you get that, is really accomplishing a pretty big thing that not everyone gets. Especially in Argentine tango there’s not a lot of live music out there, so we’re always dancing to recordings. How that’s different now than it was in the Golden Age is now we can memorize these songs and so, if you listen to it enough, you know exactly what instrument is going to come in, exactly what rhythm… and that’s how musicality is being defined at this moment is how well do you have the song memorized, how many instruments can you hear. When the violin is doing the melody, the piano is doing the little fill, and the rhythm is going, can you pick out each individual thing and have that memorized. That’s the first part. The second part to that is execution and filtering and choosing, because it’s impossible to dance everything in the music. What I tend to see is that more beginners dance in the primarily rhythmic style, because if you don’t know the song the only thing you can really dance to is the rhythm. And the better dancers get, the more they tend to dance to the melody. The rhythm is kind of incorporated, it’s there, but they tend to dance primarily to the melody. And what does that mean, dancing to the melody? Dancing to the accentations of the melody as opposed to doing kind of a straight beat [tapping with his hand]. The melody might do [humming a melody going up and down] something that’s not regular or predictable. It’s something they have to memorize. Maybe when a note is held you hold, you pause, and then if the melody can be played in a very lyrical way or very rhythmic way based on what the melody is doing you change. So it starts with the ear hearing, and then the execution. I think the better you get the less you dance strictly on the slow-quick-quick-slow. The really musical dancers start picking up stuff that’s above the rhythm, because that’s also something you can’t do if you don’t know the song. As live music progresses it will be interesting to see what happens because you won’t be able to rely on memorizing songs. You won’t know when the accents are coming. And that totally redefines the question of what musicality is, because you don’t know what’s happening next. Do you just do slow-quick-quick-slow? Part of being musical is not just putting the music in your feet and your legs. There’s what the Argentines call cadencia, which is the twisting and lilting. It’s the way the whole body reacts to the music. The whole body is sort of a musical palette rather than just the feet or legs, which tend to be the major emphasis in tango. How would you recommend beginning or even intermediate dancers develop musicality? You mentioned listening to the music a lot and obviously practicing is a big thing… Is there anything else? What do you think really helps to develop that? Knowing how to approach it in a logical way. If you learn to play the piano, you don’t sit down and learn to play the song. You learn first how to sit at the piano, how to hold your fingers, and then maybe learn the scales, so there’s a logical progression. It’s the same in musicality. It’s pretty long and elaborate. Basically it’s a progression that starts with easy musicality things like rhythm and feeling it, not only in the walk but the twist of the body, the lilt of the body. I recommend dancing on your own and then when you get with your partner sort of bring back that spirit of how you would dance in your kitchen alone if you put on tango music. You wouldn’t just walk and not move your body. There’s going to be something else going on – the hips, the shoulders, or whatever – to bring into the dance. I use that with followers a lot; followers tend to confuse following with passivity. They just follow the leader, and that’s not really good enough. I can tell when a follower is just following me, or when she’s following me and dancing with the music. It’s so much more enjoyable, so much more of a dialogue, when that happens. With a lot of followers in private lessons, I’m trying to get them to really dance more, to move with the music and just have me there to guide them. I’m going to switch gears a little bit. Tell me how your tango orchestra formed. How did your group get together? Now I’m sort of shifting gears. Before we played what’s called a la parilla in sort of an improvised style like jazz musicians. There’s a lead sheet with the notes and chords and every time it sounds different; we can kind of mess with it. So that’s more improvised. Now I’m going to more arrangements, which means I write out each note for every member of the band. And this orquesta típica – this ten-piece – gets together just for these festivals twice a year because it’s kind of expensive to put together. I asked someone for the best string players in town and got a list, so I write all the hardest parts for them because they’re the best musicians. They’re phenomenal, just amazing. You put this very complicated music in front of them and they sightread it perfectly. They’re just animals or machines or something. They’re so incredible, we’re fortunate to have them. We have the bass player from the last group and a very good pianist and four bandoneóns. When the orquesta típica isn’t playing we have a tango sextet, which is also the same orquesta típica arrangements minus two violins and minus two bandoneóns. With that group it’s possible to play in Portland because it’s cheaper and all the musicians live here. With the orquesta típica we have to fly in bandoneón players because there are only two of us in Portland at the moment. I play, and then about two or three years ago this dancer came to me and said he was interested in learning, so I went down to Buenos Aires and bought myself a bandoneón, so he has the loaner one. He practices a lot, and he’s great to have. It’s sometimes hard to carry the rhythm and do elaborate melodic stuff at the same time, so now he does the rhythm and it liberates me to play more melody and special effects. He’s an excellent musician, and he’s very solid with his time. He’s always available, and it’s great to have him. I heard that there are only six people in the U.S. that know how to play, but is that not true anymore? There are more than that, but there are not a lot. In New York you probably have four awesome players, just world class musicians. One of them played with Pugliese’s orchestra and some of the other greats. Then you have people like me who are musicians and dancers – we’re not virtuosos on the instrument by any means – but we have an interest in promoting live tango music and specifically tango music for dancing. It’s more interesting musically to play Piazzolla and things that are harder to dance to. There’s a small group of us, six or seven of us, that are really forging this territory of danceable tango music that also kind of keeps up with the times, which is tough; we do our own arrangements. There’s about six of us who are interested in that and that play bandoneón or piano. So there are very few. Since tango resurfaced in the late 80s the dance has evolved so much faster and further than the live music. Just in the last four years there are new bands in Buenos Aires and in the states that are really interested in playing for dancers. The other problem is that if you play for dancers it’s not the best way to make money. If you’re a bandoneón player, you play Piazzolla and you can make more money playing for listeners. Period. It’s a labor of love to play for dancers because you know you’re going to make less. So why do it? Well, because you love it. You love dancing and you love the prospect of the live music for dancing becoming popular and the dance becoming more popular so there’s more of a market eventually. No, I think there’s a guy in Berlin or Holland who is making new ones, but I’m not sure. There’s not a huge market. Typically they get reconstructed. Mine got new bellows… I paid $2,300 for mine. A couple of people who have been down to Buenos Aires in the last three or four years say you can’t find an instrument for less than $4,000. So the price has doubled, which means there’s more demand, and that’s good in a sense. I’m glad I bought mine when I did so I didn’t have to pay as much. Luckily I knew music before. There are a lot of people who want to learn bandoneón, but learning music and learning bandoneón is a doubly hard task. It’s already a hard enough instrument if you are a musician. I taught myself – I got maybe four private lessons – but I knew, because I played saxophone and I’ve studied music, to approach it in a sensible manner. I learned my scales, and I paid my dues early on to a certain extent by doing sort of boring exercises so I could actually learn how to play the instrument. I’m sure there are a lot of technical things that I do incorrectly. I get a private lesson whenever I can, whenever I’m in New York teaching or whenever these guys might come to town or to Seattle, I drive up to Seattle and take a lesson. 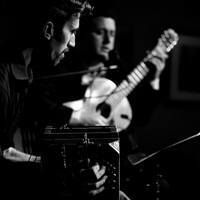 Has playing the bandoneón changed your experience or perspective in dancing tango? Or is it just a deeper understanding of the music? That’s a good question. I don’t think it’s changed – playing the bandoneón – the way I dance. But what has changed the way I dance and understand the music is doing the arrangements. Writing the music, taking a composition and arranging it, listening to recordings and seeing how they did it in the Golden Age, what the tricks are to make it sound like Argentine tango. But just playing the bandoneón, I don’t think so, but maybe it has. Maybe because you already had such a background in music? I think musicians in general have a better trained ear, but the ear is only the first part. Like I was saying before, the second part of musicality is the translation into the body. There are people who study dance all their lives that might not be musical if their ear isn’t trained, and there are musicians who have the ear but might not be musical dancers because they don’t have the body. You need both. But there are musicians and non-musicians that are fabulously musical dancers, and they don’t understand anything about how to arrange a tango or how a tango is structured on an intellectual level, but they’ve been listening long enough to know what’s there. You already touched on this a little bit, but what do you think live tango music brings to the dance that recorded music doesn’t? I think it will push – I’ve mentioned this to my students as sort of a challenge. Sometimes when the band is playing, if you’re a really musical dancer take dancing to that music as a challenge. We know you can do it perfectly to the recorded music, but now try this. I egg them on, and I think that works because yes you can dance to the recording, but what do you do to this? It’s a totally new challenge. I think the other thing is just the ambiance. If you throw a party, the difference between playing a CD and having a live rock band or jazz trio or whatever… you can’t even compare them. Just the difference in sound quality but also the musicians being right there is truly something that’s happening in the present moment on all levels: you’re improvising the dance, the musicians are sometimes improvising, or the tempo might be different. It’s something that’s totally unique to the moment. Recordings are beautiful, but we’re dancing now to music that was recorded sixty or so years ago. Sometimes when people first come in to dance they say this music sounds like it’s for a silent movie. It feels like we’re transported back in time, which can also be a good thing. I think for me as a party organizer or host for milongas, the ambiance of good food, the place smells nice, the temperature is right… You’ve got the right music, the right people, and nothing can compare to that; no CD can compete. Even mediocre live music compared to a good CD – live music does everything. Yes, definitely. I think now there are more teachers doing it, but as far as I know before me Rebecca Shulman in New York was one of the only people that really taught musicality separate, who said this is an issue that you need to get. It’s not just saying to do the sequence, or by the way here’s the rhythm of the sequence, but here is what’s happening in the music. And after I learned bandoneón I think I was the first teacher to use the instrument in my musicality classes. A lot of people had never heard a bandoneón live. Now there are a lot of great teachers. Musicality has become a big issue in a lot of teachers’ repertoire. I’m so happy that’s happened rather than ganchos being the most important thing in the world. Even the students recognize it. If I teach a musicality class in Portland, these classes are full all the time. Even the students know it’s important. I’m glad that’s happening. I love dancing milonga, teaching milonga classes frequently. I think how I stand out – at least when I travel – is I don’t go to places and not teach musicality. I was in Chicago two or three weeks ago and taught three musicality classes out of seven. The organizer wanted me for that; they know me for that a little bit. It’s become my niche. What about any resources you recommend that might provide good inspiration for musicality? I’m actually working on a musicality DVD. I’ve filmed sixteen hours of material, but I’ve run into music rights issues. So if someone wants to give me $15,000, I’d produce the CD and it would be out tomorrow. As far as I know, from a dancer’s standpoint, on musicality there’s nothing out there. There’s a book by Horacio Salgan, a very famous tango pianist. It’s called Curso de Tango. It’s in Spanish, comes with a CD. You can get it online if you do a Google search. If you’re a musician and you read Spanish, it’s a great introduction to what makes tango tango. It’s totally for musicians. If you’re a dancer it’s not going to help you at all. It might be interesting, but it’s not going to help your dancing. As far as dancing goes, I think just watching musical dancers. Go to YouTube and watch dancers like Chicho [Frumboli], Gustavo Naviera, Sebastian Arce. There are many others that are beautifully musical, but these are the three that for me made a huge difference. The first time I saw Chicho dancing milonga in Buenos Aires in ’98, it was like that’s what the dance is about. This guy was standing out and he was so musical, I just thought this is so cool, I want to do that. So getting that inspiration is even more important than reading any instructional book. It’s just being inspired by someone enough to make it your personal quest to want to do that. Click here to go back to Part 1 of this interview.